BOY! This engagement session has been LONG overdue! Brandon and Rebeckah have been SO patient with us and the weather. The first time that we tried to scheduled their boat engagement session, the forecast was nothing but thunderstorms and rainy days for the week, which doesn’t make for the best boating weather. Then, the morning of the day their engagement session was re-scheduled, Tony decided to saw his finger off at work! Ever since I saw The Notebook, I’ve had a slight obsession with boat engagement shoots. It’s as hopelessly romantic as it ever, ever gets and this engagement session is just another reason why. Brandon and Rebeckah both love going out in the boat, catching fish, soaking up the sun while sipping beers and then going home to have a BBQ and settling in to a good movie. So it was kind of a no brainer to capture this special season of their life on their boat! We all had so much fun that we ended up just hanging out on the dock afterwards, chatting it up. We have both known Rebeckah and Brandon for quite a while now. We all grew up in Southern Maryland together and around here, everyone seems to know each other somehow. We had the honor of even photographing this precious love last year before they were even engaged on Brandon’s family’s farm! Rebeckah was actually a bridesmaid and Brandon was the best man in Sandra & Cory’s Wedding just last month! Now, it’s their turn! May can not come soon enough for these two do say “I do!” We’re so excited for you both! 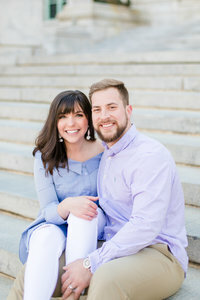 To see other engagement sessions and weddings in Southern Maryland on the water, look at these blog posts!